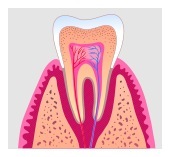 Root canal treatment is the process of goingaaa inside the pulp space and removing the infected, dead tissue. The space is then disinfected and sealed with special materials. Nowadays, root canal treatments are performed with advanced techniques and materials, making them far more comfortable and faster. After root canal treatment is complete, your restorative dentist will usually place a crown on your tooth to safeguard against fracture.